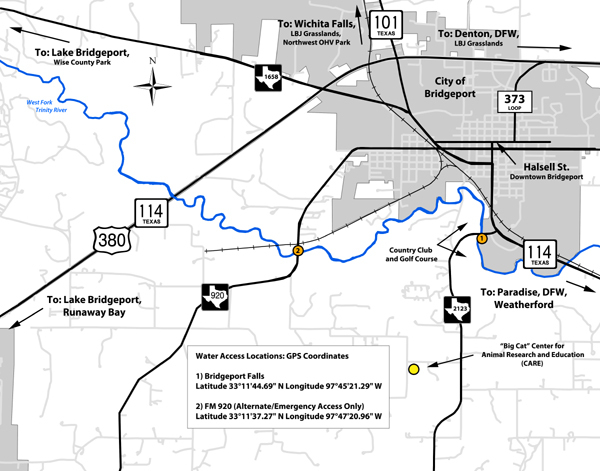 From Ft.Worth/ Dallas take SH114 west to Bridgeport. As you enter the south side of Bridgeport, turn left on FM 2123. Signs for Bridgeport Falls Parking immediately visible on the left. Note: Invasive zebra mussels threaten this area. 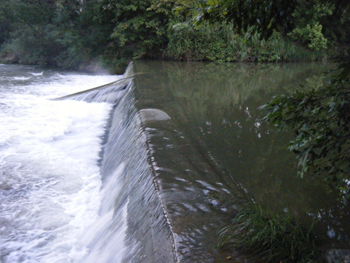 To prevent further spread of this pest, paddlers are required to drain all water from their boats before leaving the river. Get details. Please note: Downstream of Bridgeport Falls is not an official part of this trail. 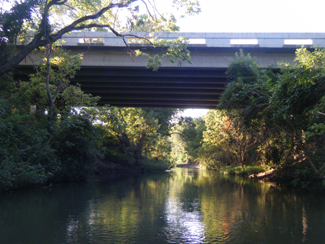 Any downstream paddling will require take-out at public roadway crossings such as CR 3225 and FM 51. These access points are unimproved and may present challenges, steep grades, thick brush, etc. 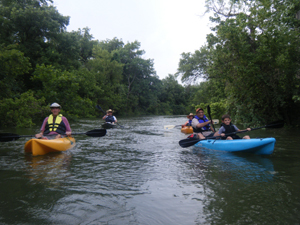 The West Fork of the Trinity River is a natural river that is typically unrestrained by flood control dams or other man made structures. As such, the West Fork of the Trinity River is readily influenced by rainfall runoff that may create temporary high flows and undesirable water quality conditions. Approximate flow and water quality information is available to paddlers on the web at www.trwd.com. Although there are no man-made obstructions on this reach, there may be snags to avoid, especially when water levels are low. 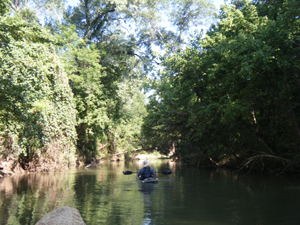 This section of the West Fork of the Trinity River supports several species of carp, bass, catfish, crappie and carp. Small lures such as jigs, plastic worms, spinner baits and light-line are recommended. You can fish along this trail, and fishing can also be enjoyed at nearby Lake Bridgeport. The riparian corridor of the West Fork of the Trinity River supports a great diversity of plant and animal life along the river and beyond the banks. Five miles west of Bridgeport, this 13,000 surface acre lake features over 170 miles of shoreline ranging from sandy beaches to sheer rock cliffs. Several boat launching facilities and waterfront businesses are available for your paddling or boating convenience. The lake is also home to the Methodist Camp and Conference Center and the 3,000+ acre Sid Richardson Scout Ranch. 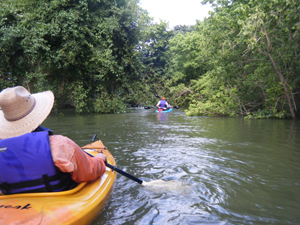 See Texas Paddling Trails Information provided by Runaway Bay, Texas at the Chupacabra Point Paddling Trail website. Old Town Bridgeport was created when a bridge was built for the Butterfield Overland Mail Stagecoach Route in 1860. The Bridgeport community comes together every spring celebrate our stagecoach heritage to provide family friendly events, activities, and vendors in Harwood Park. The Bridgeport Riding Club also holds a large PRCA Rodeo bringing cowboys and cowgirls from all around. Bridgeport was once a coal town with thirteen thriving coal mines. The coal mines are no longer operational but the city still celebrates the impact from this early economic activity. The heritage is celebrated with a downtown festival put on by downtown businesses, street vendors, local arts groups and many community groups.